The lower part of this print shows Kawarazaki Gonjūrō I (初代河原崎権十郎) as a water seller (mizu-uri) from the series Seven Calligraphic Models for Each Character in the Kana Syllabary. A whole essay could be written about the beauty, design and symbolism of this print. 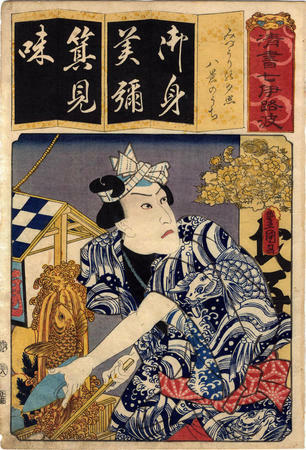 Created late in Kunisada's career, just ten years before his death, it belies the belief that his late works were weaker than his early ones. Most obvious are the gorgeous carp images both on his robe, but also the golden carp leaping up the waterfall to that fellow's right - our left. But there is more: click on the print so you can see a larger magnification of it and you will notice that above the signature cartouche on the right side is a picture of a lion gamboling among peonies. What is that about? We don't know, but hope to one day. Stay tuned.